One of the more polished pieces of home brew on the internet got an update. 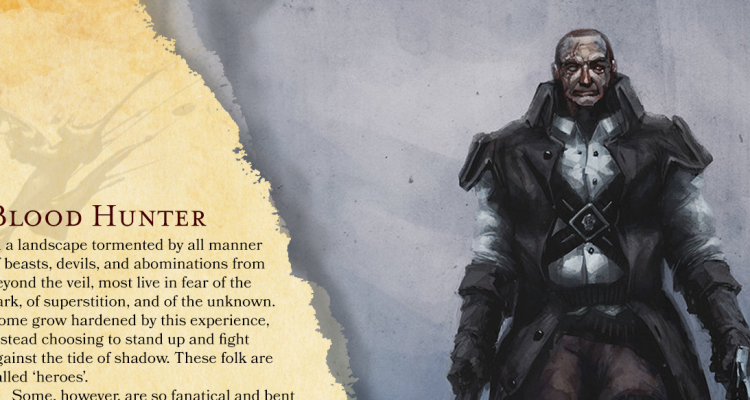 On December 9th, Matt Mercer released a reworked version of his Witch Hunter class (now called the Blood Hunter) on Geek and Sundry, and it stands as one of the best examples of community made content out there. For those of you who don’t know, the original Witch Hunter, found here, was created by Mercer as part of a promotional D&D campaign run in conjunction with the release of The Last Witch Hunter, a D&D inspired movie starring Vin Diesel. Diesel himself has been an outspoken D&D advocate for years and jumped at the opportunity to get back into the game to promote the film. Highlights of the game with Diesel playing the custom Witch Hunter class can be seen here. Now that the promotional period has ended, Mercer has sat down to rework the class, making both flavor and balance changes. The result is a much more functional and interesting class overall. One of the first problems I noticed with the original Witch Hunter class was that it was primarily a melee damage dealer, but that its hit die was only a d8. On top of that, its fundamental damage dealing mechanic forced it to sacrifice health. At the end of the day, the class played like a melee warrior that effectively only had a d6 hit die. The new Blood Hunter solves this problem and many others with a variety of new features and changes, most of which are listed in Mercer’s original post about it. For instance, the class is now much beefier with a d10 hit die and has more options for combat specialization. As a player, you get more abilities sooner, such as moving (and renaming) Blood Rite from level 2 to level 1. A new feature added to the class is called Blood Maledict and it is a much improved version of the old Rune of Binding from the original Witch Hunter. It works both in terms of mechanics and flavor because it gives the class more options and opportunities to explore one of its major themes: blood sacrifice. The multitude of abilities here are fun to play with and each one reflects the theme of the class much better than Rune of Binding. The Order of Mutant also returns with some much needed changes. 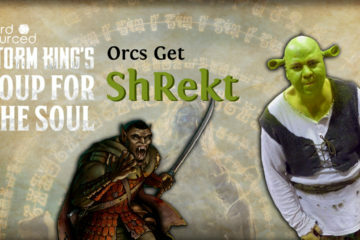 Some underpowered mutagens were removed entirely and a few side effects were rebalanced. Not everything is for the best, however. Replacing the use of constitution with a Mutation score helps balance the class, but it unfortunately comes at the cost of flavor. It doesn’t feel right that the class has no use for constitution when it is all about using one’s own blood against enemies and ingesting mutagens. Some other minor problems remain such as the differentiation between Primal Rites and Esoteric Rites being essentially meaningless and the Order of the Profane Soul being much weaker than the other two Orders in terms of originality and flavor. Blood Hunters who choose Profane Soul use warlock pact magic to grant themselves spell casting, but strangely it doesn’t seem to matter which patron you choose. Choosing between patrons and knowing the differences between them is the most fundamental part of using pact magic. It begs the question: why choose pact magic if the very pact you get your magic from is irrelevant? Thematically, this feature doesn’t make much sense and seems like a wasted opportunity. 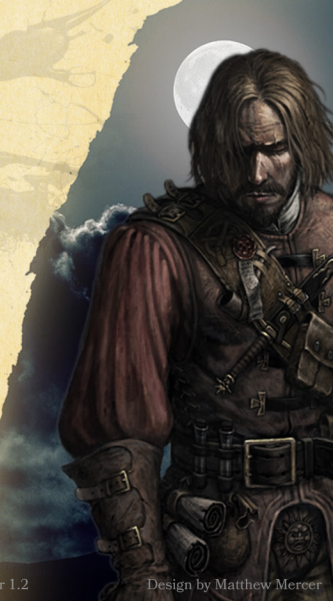 Blood Hunters should have their own magic system, not a poorly adapted system from another class. 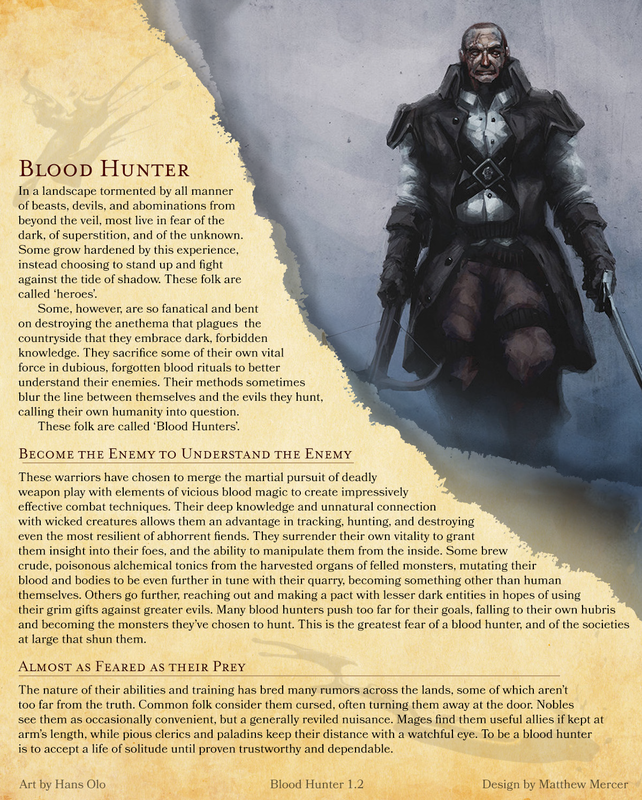 Despite these few flaws the Blood Hunter still stands as a much stronger class than its predecessor and has some truly unique and interesting mechanics to play with. Let us know what you think about the new and improved Blood Hunter class in the comments below.